Please confirm the colours and sizes of the items required on the Checkout page. 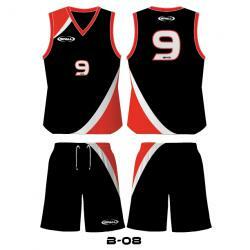 d-sports BB08 Basketball Uniform - -Sublimated design. Price includes any printing such as numbers, team logos, players names etc. -All styles are available in any colour combination. No related products for the d-sports BB08 Basketball Uniform. No key features selected for the d-sports BB08 Basketball Uniform. No quantity discount for the d-sports BB08 Basketball Uniform.